RB LeSean McCoy vs. LB Luke Kuechly – Sunday will see one of the best running backs in the NFL go one-on-one with one of the best linebackers. McCoy had a strong Week 1 performance against the Jets, earning an overall PFF grade of 79.6, the sixth best by a runner. 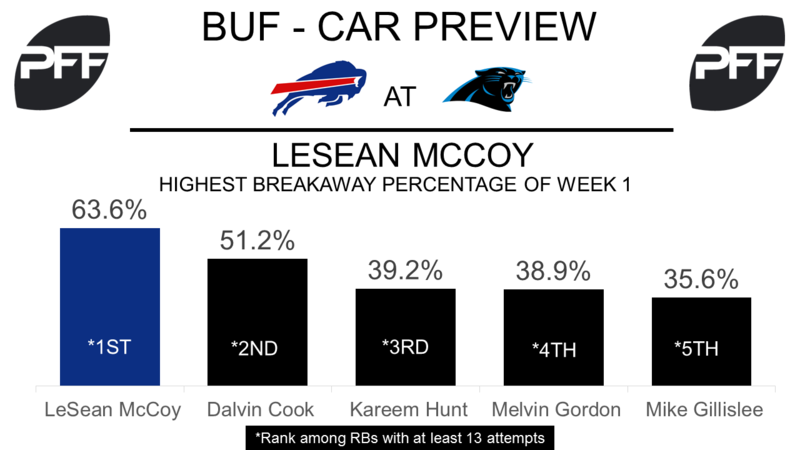 He led the NFL with a 63.6 breakaway percentage (percentage of yards gained on runs of 15 or more yards) as McCoy earned 70 of his 110 rushing yards on runs of 15 or more yards. Kuechly was dominant against the 49ers, he ranks 12th among linebackers after Week 1 with an overall PFF grade of 82.3. He was able to pick up one run stop on 14 run snaps for a run stop percentage of 7.1 which ranked 22nd among 36 linebackers (a run stop is a tackle made in run defense that results in a “WIN” for the defense). T Cordy Glenn vs. EDGE Mario Addison – Glenn had a strong performance in pass protection Week 1, only allowing one total pressure on 26 pass-blocking snaps for a pass-blocking efficiency of 97.1 that ranked 16th (PBE measures pressure allowed on a per snap basis with weighting towards sacks). But he really struggled in run blocking, his run-blocking grade of 29.9 was the third lowest among offensive tackles in Week 1. Addison had the 19th best grade by an edge defender in Week 1 with an overall PFF grade of 80.4, but he too struggled in the run game, earning a run defense grade of 51.1. He also failed to pick up a stop in run defense on his eight run defense snaps. QB Tyrod Taylor vs. CB James Bradberry – After Week 1 Taylor ranks as the seventh best quarterback with an overall PFF grade of 80.9, but it wasn’t just as a runner that he impressed. His passing grade of 77.9 was the eighth highest by a quarterback in Week 1. Taylor found success on play action, finishing with the second-best passer rating using play action at 151.2. Bradberry picked up where he left off after a sensational rookie season, against the 49ers in Week 1 Bradberry was targeted seven times and only allowed four of them to be complete for 42 yards. Brian Hoyer didn’t have much success when targeting Bradberry, as he only had a passer rating of 74.7 when doing so. 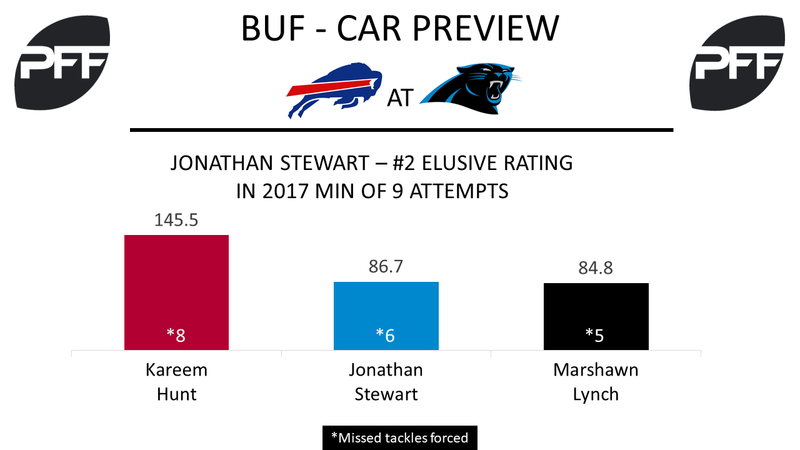 RB Jonathan Stewart vs. DT Kyle Williams – The buzz in the Panthers backfield prior to Week 1 was around Christian McCaffrey, but Stewart’s grade ended up being 86.7 overall, the fourth highest grade among running backs. Stewart’s 86.7 elusive rating was the second-highest among running backs with at least seven carries in Week 1, as he forced six missed tackles against the 49ers. While Williams only played nine run defense snaps against the Jets, he earned an 80.2 run defense grade with one run stop. Williams’ moved back to defensive tackle this season after playing defensive end in 2016, his 26 run stops last season led all Buffalo defensive lineman. T Matt Kalil vs. EDGE Jerry Hughes – Neither Panthers tackle graded very well in Week 1 but Kalil’s 52.2 pass blocking grade was the worst on the team. He only allowed one pressure on 25 pass blocking snaps but since 2014 he has allowed a pressure every 11.1 pass blocking snaps. Hughes, dealing with a position switch like Williams, led the Bills in total pressures in 2016 with 50. That ranked 15th in the NFL among 3-4 outside linebackers but his 68.1 overall grade was his lowest grade since 2011. But he was only able to record two pressures against a Jets’ offensive line that ranked 20th in the league entering 2017 according to PFF. WR Russell Shepard vs. CB Leonard Johnson – Shepard only had two targets against the 49ers but turned one of them into a 40-yard touchdown with 21 of those yards coming after the catch. He’s one of only four receivers to record a catch in Week 1 with a perfect passer rating of 158.3 when being targeted. His 85.7 percent of routes run from the slot ranked 11th in the league among wide receivers. New slot cornerback Johnson will be tasked with keeping Shepard from having a repeat performance in Week 2. Johnson is looking to improve on his performance over the past few seasons, since 2013 his grade has been no higher than 42.8 overall. In Week 1, Johnson allowed five receptions on six targets from the slot, both among the highest in the league, and a passer rating of 93.8.